Before Apple released the first iPad, I doubted that I’d ever want to use it as my primary reading device. Compared to the Kindle, with its paper-like e-Ink technology and super light weight, I thought the iPad would be hard on the eyes and clunky. Boy, was I wrong. I now enjoy reading books on my iPad almost as much as enjoy doing so on my Kindle 3; in certain situations, the iPad actually has some advantages. In fact, the biggest question now isn’t whether or not I should use the iPad to read, but which app should I use? The two e-reading apps I use most on my iPad are Amazon’s Kindle app and Apple’s iBooks app. Each is free, and each is linked to its own dedicated store. To shop for Kindle books, you must use a Web browser to shop at Amazon’s Kindle Bookstore; fortunately, Mobile Safari on the iPad is great at that. For far too long, browsing Apple’s iBookstore was only possible from within the iBooks app itself; fortunately, a recent update to the iTunes Store allows you to use your Mac to find books, too. With each app now, you can purchase books from your Mac, and they’ll wirelessly sync the next time you launch the appropriate app on your iPad. One of the big advantages of e-books compared with the paper kind is that they’re customizable; you can modify the text to suit your needs. In the Kindle app, you can choose to view black text over a white background, dark brown text over a sepia-toned background, or white text over a black background. The app offers six font sizes, from painfully small to comically large. And it has its own brightness control, which you can use in tandem with or instead of the iPad’s. You get a different mix of text options in iBooks. There’s no white text on a black background option; you must choose between black on white or sepia tones. That said, it does give you your choice of eleven text sizes (from even more painfully small to even more comically large). And you can customize those fonts, by choosing from six clear, crisp options. (Kindle lets publishers set the font, and you can’t override that setting.) An iBooks option that I treasure even more hides in the Settings app: You can toggle full-text justification off, which I find makes text much more readable. Kindle offers no such option. Like the Kindle app, iBooks offers its own brightness slider. iBooks’s actually provides more control than the iPad’s system-level brightness slider. If you drag the brightness slider in the iPad’s multitasking shelf all the way to the left, the iBooks slider goes left (or down) too. But if you turn the iPad’s own slider to its darkest setting, the iBooks app’s control can make it darker still. The brightness controls in each app are very important, particularly for nighttime reading. While a true Kindle (or other e-Ink device) can outshine the iPad for reading in the sun, the iPad wins hand-down for reading adjacent to a sleeping spouse in a darkened bedroom. You don’t need a book light; instead, you just dial the brightness way down so that, while you can still do your reading, you’re not projecting that back-light all over the room. In that context, I prefer the Kindle app’s white-text-on-black setting, dialed down to the app’s maximum darkness setting. 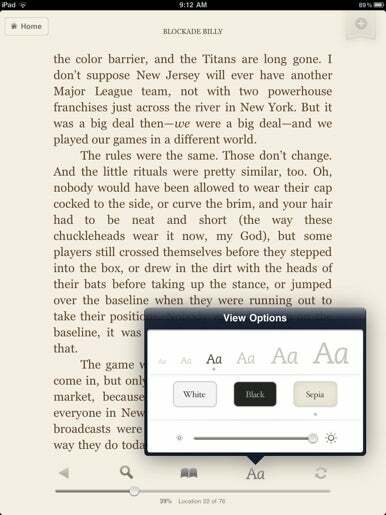 While adjusting font size and brightness is an advantage for e-books over paper, those apps have a harder time letting you know where you are in your book. The Kindle app does so in four ways: It displays what percentage of the book you’ve read; the “Kindle location” (a digital page number that remains constant, immune to font and screen size); a horizontal progress bar; and actual page numbers. (Many Amazon e-books support actual page numbers, but not all.) You’ll always know where you are in the text. 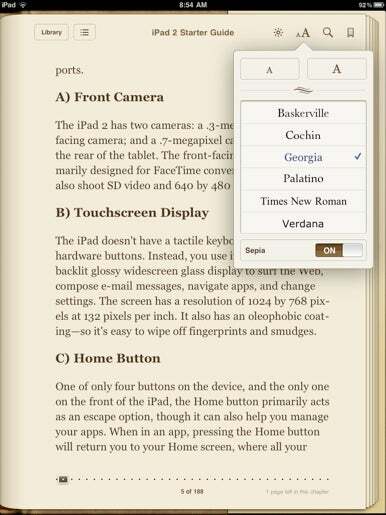 By contrast, iBooks focuses on page numbers, too—but what the app refers to as “pages” are strictly virtual ones. The page number at the bottom of the screen (256 of 287, for example) will change entirely if you switch to a larger font. iBooks also displays a progress bar, and it includes one more nicety that I wish Kindle (both the app and the device) would mimic: a tiny line of text that says something like “6 pages left in this chapter”—a wonderful digital alternative to flipping ahead in a book to see how close you are to a good stopping point. The two apps take strikingly different approaches to design. iBooks attempts to recreate the feeling of a real book, down to the binding. Kindle skips such accoutrements, and just shows the text starkly bare. But the truth is, it doesn’t much matter. Once you’re reading—presuming you’ve picked a good book—the app’s design will fade into the background. Similarly, while it’s more fun to swipe to get to the next page, you’ll likely switch to simple taps on the screen’s edge instead; it’s faster, and thus lets you start devouring the words on the next page even sooner. There are few downsides to e-reading apps. In my experience, Kindle is an unapologetic battery guzzler, and I’m not sure why; turning off Wi-Fi seems to help. The only other problem is that I’m spending more on books than I ever did before. Luckily, e-books are generally cheaper than their paper counterparts, and services like Lendle.me make it easer to borrow books, too. Amazon says that it will introduce library lending support in 2011; Apple hasn’t yet announced similar functionality for iBooks. I now rarely curl up with a good book—in paper, at least. I do it all the time with my iPad. Reading books on it now feels entirely natural—so much so that I actually prefer that to the old paper way.